Now, this writing business is becoming a bit tiresome (especially as it’s 1:30 am and I’m switching between tabs keeping an eye on Sylvain Estadieu swimming butterfly across the Channel) so I’m going to continue this post as substantially captioned pictures. I finished the swim in a time of 1:20:45, which was much faster than expected. My average pace throughout the race was 1:15 per 100 m. I struggle to hit that time in the pool, let alone turn around on it 65 times in a row, so I think that the current may have been taking about 0:10 off every 100 m. I was delighted to see that I actually finished in sixth place, and was only 7:11 behind Damián (who placed first) and 4:18 behind Esther (who placed fourth). Imagine that: only two places behind Esther Núñez! I was feeling very smug indeed entering the finishers’ area. 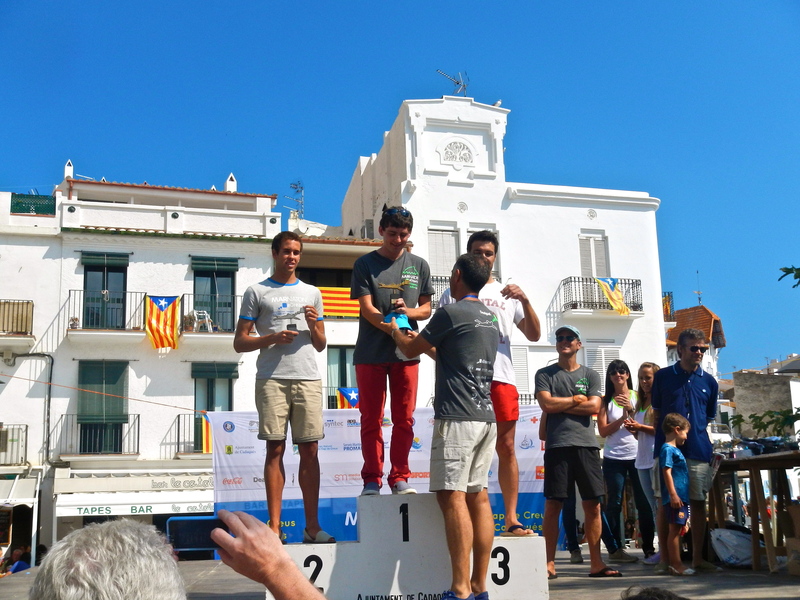 Just after me was Miquel Suñer, who swam without a wetsuit. 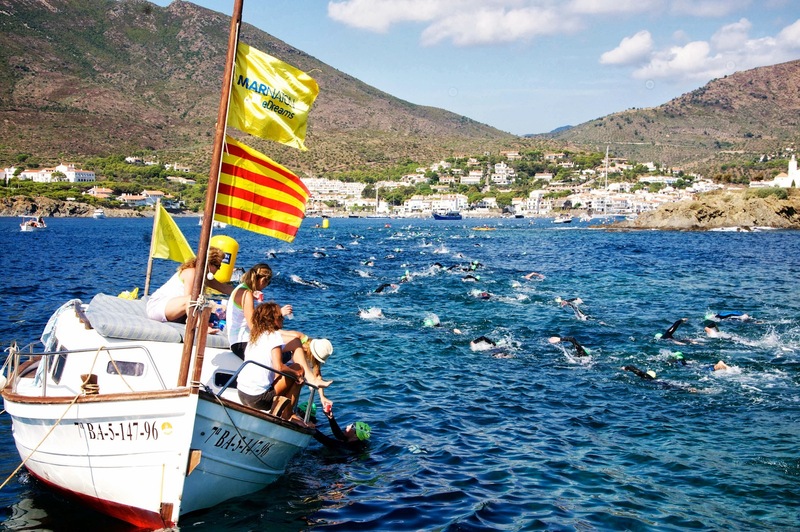 Only the week before, he swam 30+ km around the entire Cap de Creus peninsula! Before I got a chance to take off my wetsuit, Esther alerted me to the fact that there was a couple calling me from the beach. The couple was Donal and Edna O’Lochlainn from Fermoy who were in Cadaqués on their holidays… Fermoy people: you just can’t escape them! They even had the Fermoy flag with them for the occasion so Damián and I had our picture taken with it. It was great to meet Donal and Edna at the event and very nice to have some local support. Mauricio and I met them again later that evening for a drink. Damián, Esther and I hung around in the finishers’ area for another while, meeting all of the swimmers that we had met at dinner the night before. 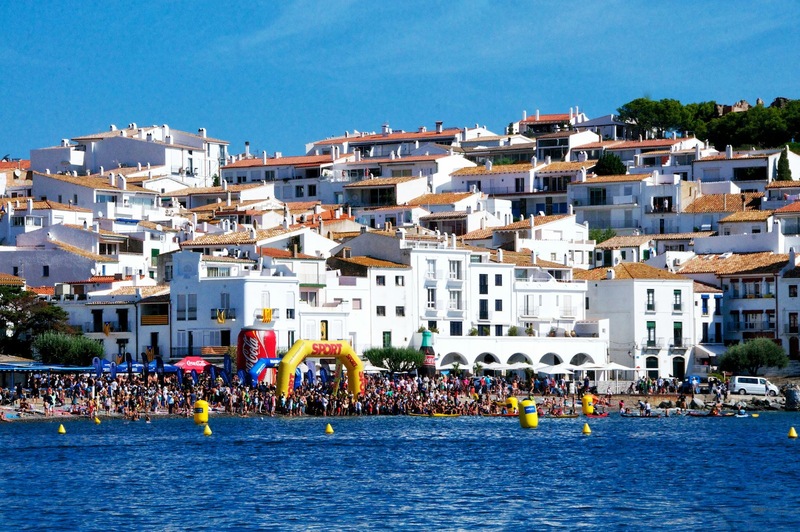 The area was very well set up: the swimmers had a nice patch of beach to mill around in, there were chairs, showers and stands with lot’s of soft drinks, water and fruit. On your way out of the finishers’ area, you passed “baggage reclaim” where you picked up your things which had been transported from the start for you. In the plaza, there was also free recovery massages and even an inflatable medical centre! The whole setup was very impressive and great credit is due to the organisers for the effort that they put in. By the time we’d seen the results it was nearly midday and getting very hot, so it was time to cool off in the hotel pool before heading back for the presentation of the prizes at 1:00 pm. Right after the prizes we had a really nice lunch by the hotel pool. I was advised to try a local dish – a Catalan noodle paella – which I must say was really nice and hit the spot very nicely after the race! After, all that swimming, talking and eating, we were all exhausted so it was time for a siesta by the pool (there’s that pool again). That wasn’t the end of it, though! 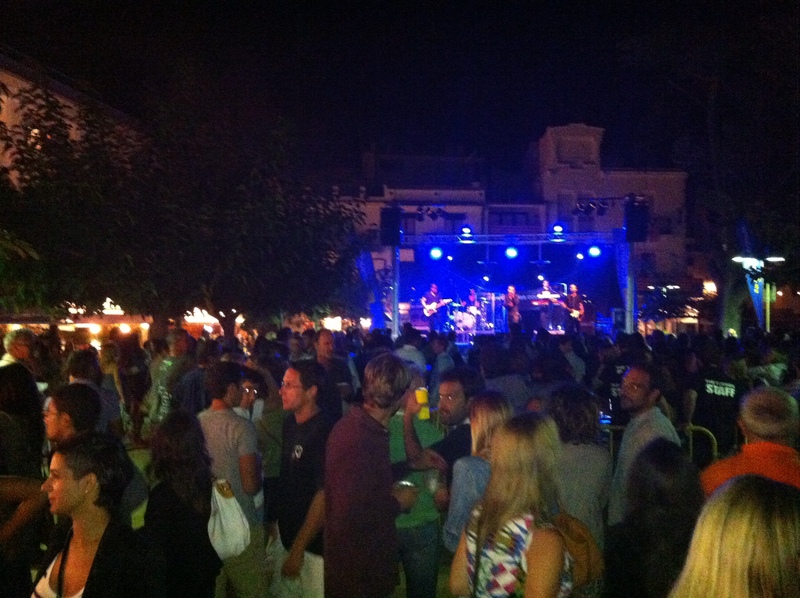 After the band stopped, the party continued into the streets of Cadaqués. The group eventually found our way into a tiny nightclub in the village where we stayed until 5:00 am when I was disgusted to have to leave to catch my bus back to Barcelona and fly home! Still, I’d had an absolutely amazing day and a half with brilliant people – a simply surreal experience. Thanks a million to Mauricio for looking after me from start to finish. Thanks to Damián, Esther, Miquel and all my new swimming friends for their hospitality. Well done to Miquel, Pablo, Irene, David and the rest of the Marnaton team on organisation such a superb event. I can’t wait for next year! Eager for one last summer race before heading back to college, I flew from Cork to Barcelona on Friday. On arrival there, I met Mauricio who kindly took my bag and showed me where to wander around in Barcelona for the afternoon. 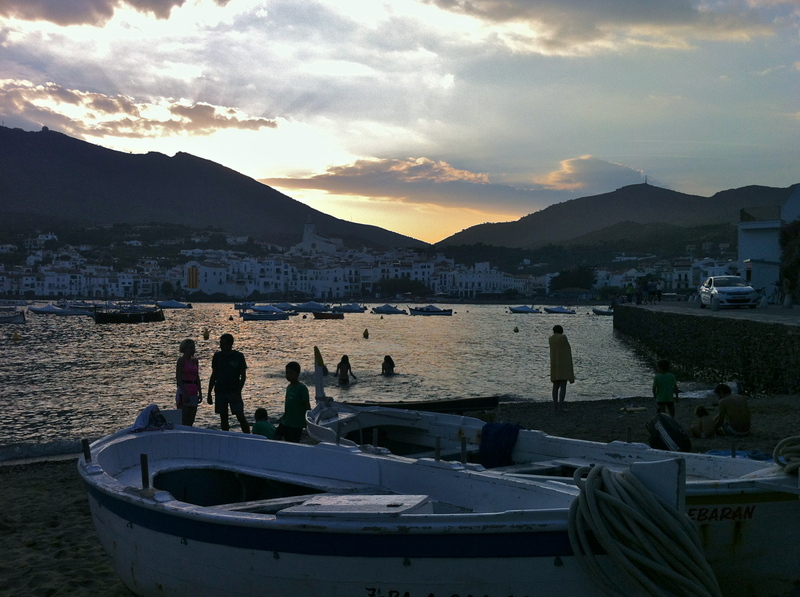 After a stroll around Las Ramblas, Mauricio and I met up again and headed for Cadaqués, which is about 2 hours north of Barcelona by car. 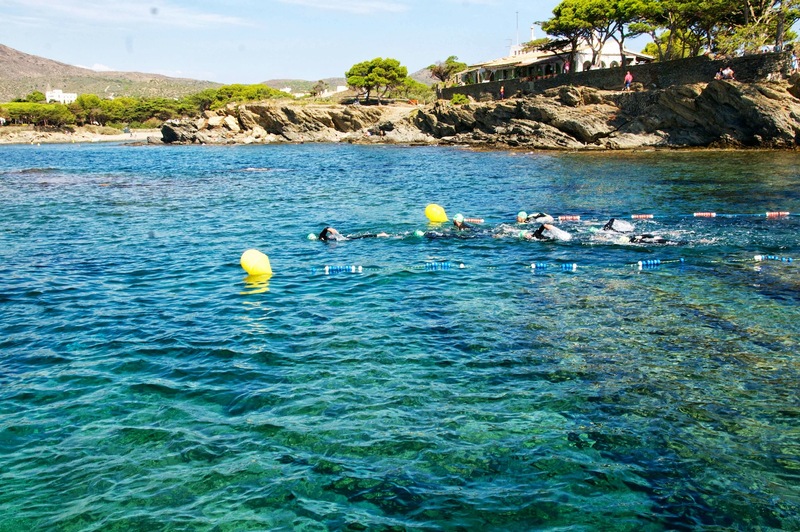 When we got to Cadaqués, we took a drive to the start of the swim at Cala Jugadora in the Cap de Creus national park. 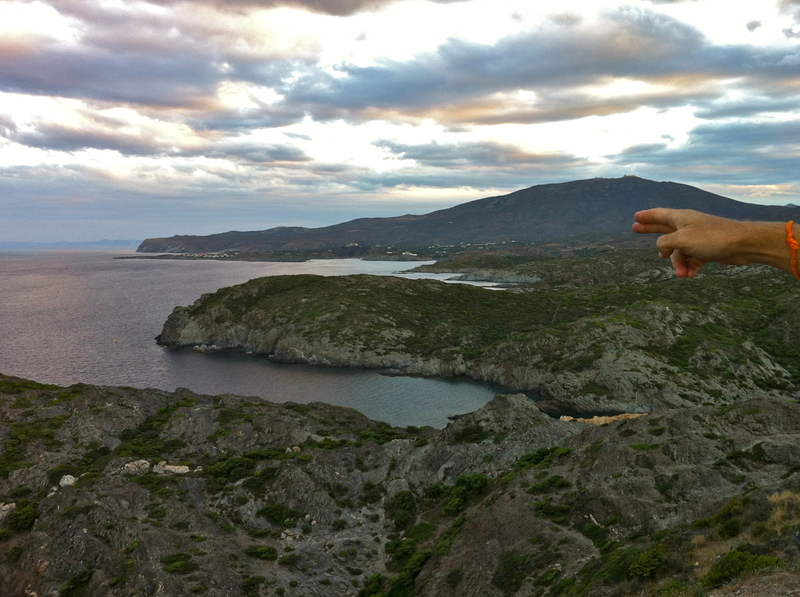 The whole area is spectacularly beautiful with rocky mountains, lots of greenery and azure blue sea. Having checked out the swim course from the cliffs, we headed back to the village and checked into the hotel. 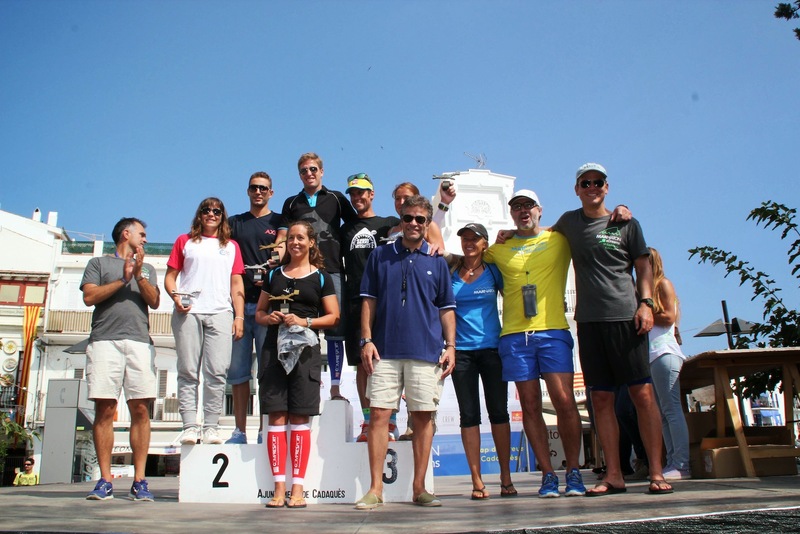 There, we met the most successful couple in open water swimming: Damián Blaum and Esther Núñez. I first met Damián last year while we were both in Dover and crewing for Trent Grimsey on his English Channel world record swim. He is the current FINA Grand Prix Champion. Esther was the GP Champion in 2007 and 2012 and was second this year. They would both be taking part in the race the following day! 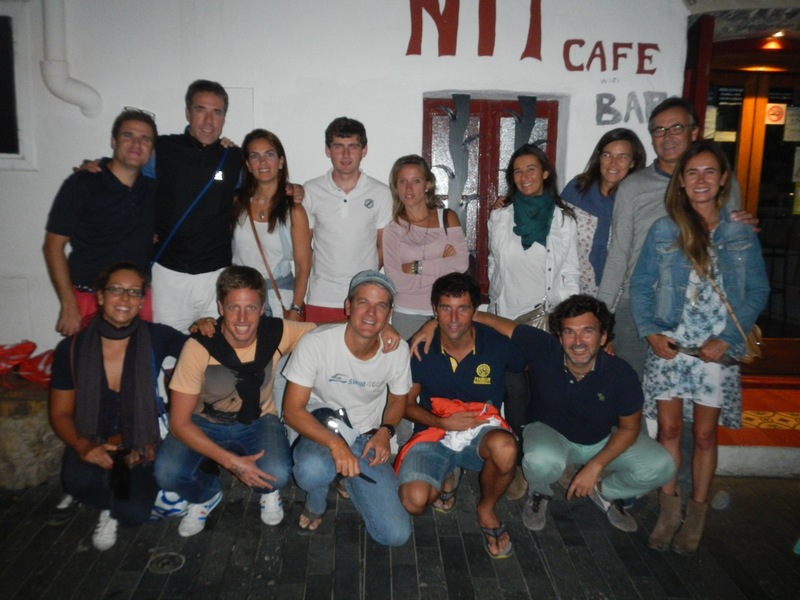 That evening I had dinner with Mauricio, Damián, Esther, Miquel Suñer and many local swimmers. It was a great evening and I got plenty of exposure to the Spanish and Catalan languages! After dinner at Casa Anita in Cadaqués. Back row (l-r): Pablo, Jordi, Lorena, me, Ester, Cristina, Cristina, Alberto, Marta. Front row (l-r): Esther, Damián, Mauricio, Miquel, Rafa. The next morning, we had to be up early to travel to the start point. Breakfast at the hotel was at 7:30 am. Most swimmers tried to imitate what Damián and Esther were having for their breakfast but it was difficult to keep up! After breakfast, we travelled to the start by car – we could only go so far by road and had to walk the rest of the way. 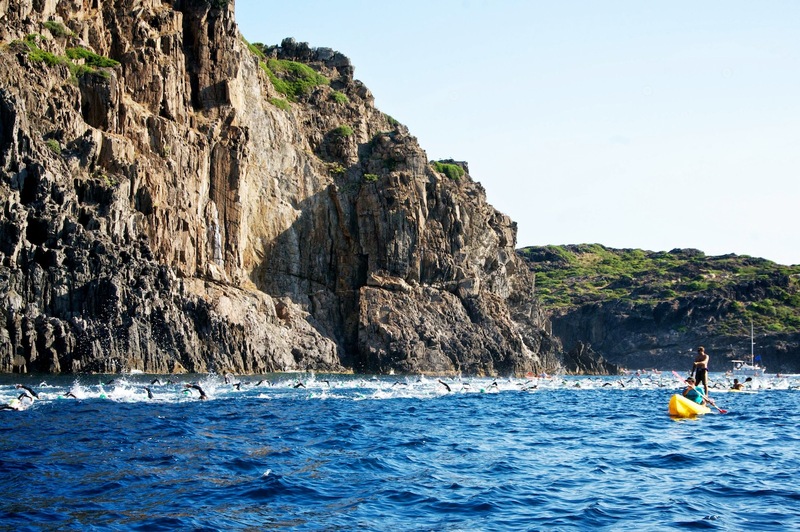 All of the swimmers got changed in the glen that leads from the road to the cove. 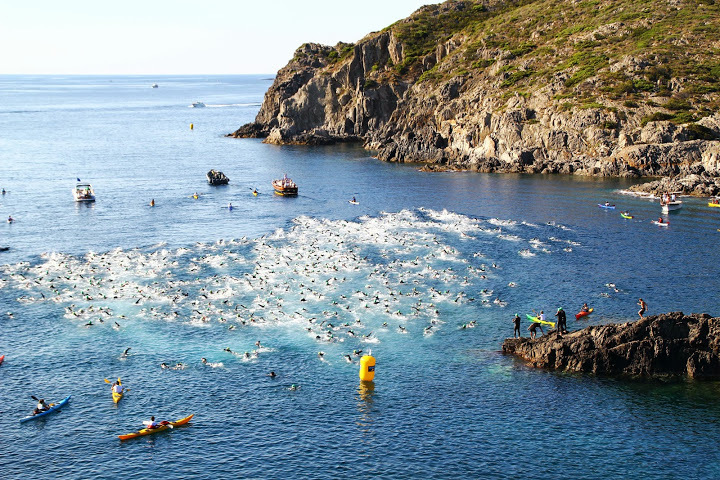 All but two of the nearly 600 swimmers got our wetsuits and, like penguins, made our way to the water! I was relieved to jump into the sea as I was getting quite hot standing around in my wetsuit. The water was at least 18ºC, crystal clear and very saline: I’d never felt so warm and so buoyant in the sea! I followed Damián, Esther to the best start position. 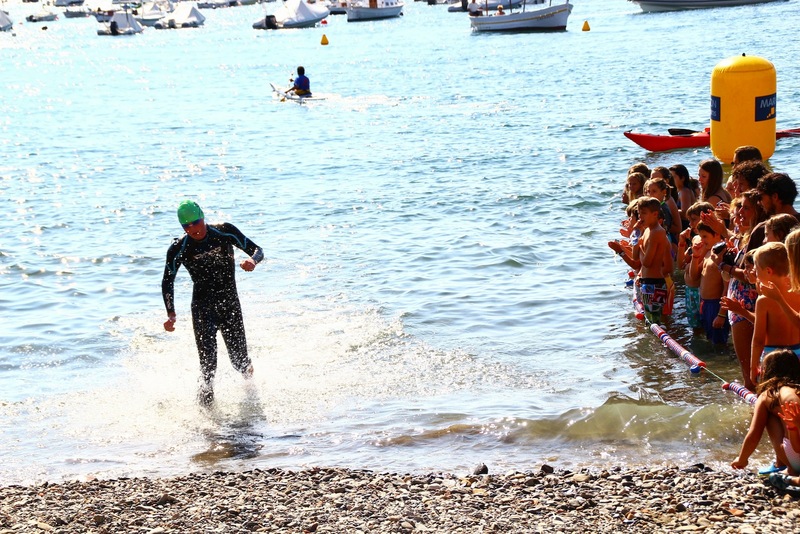 There, we met Miquel, who was swimming without a wetsuit. 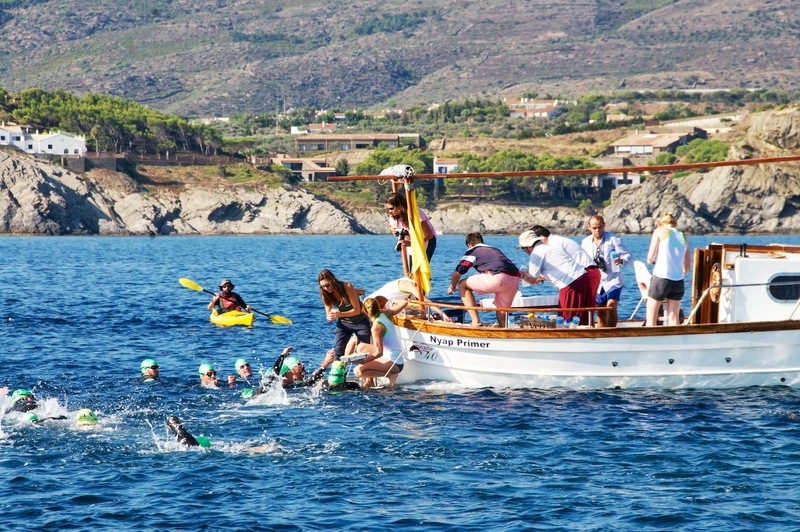 Once all of the swimmers were congregated in the start area, the horn blew and we were off!